1. 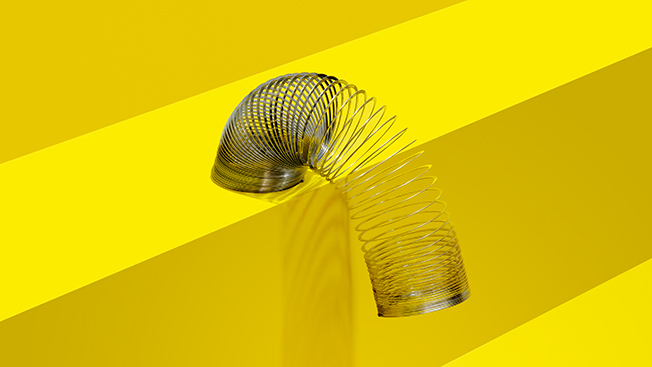 (of an object) Able to recoil or spring back into shape after bending, stretching or compressing 2. (of a person or animal) able to withstand or recover quickly from difficult conditions. As our supply of cheap, concentrated fossil fuels stutters and dwindles, and the industrial age that has ridden on its back for so long enters its twilight years, it is a certainly that most of us will find ourselves experiencing great change. Despite all the bluster and inflated claims of a new ‘green’ era in which people will be able to continue their high consumption lifestyles and enjoy all the benefits accorded by globalised supply chains, the facts — as I’ve been researching and writing about for the past eight years — simply don’t stand up to any meaningful analysis of this possibility. A minority of critically thinking people have accepted this and recognised the likelihood that their lives are going to take a turn for the materially poorer in the immediate future. A smaller minority still have decided to actually take action in preparation for this. These people have seen that all is not well in the three major ‘E’ realms of energy, environment and economy, and are concerned about what it means for them and their families. They may hold differing opinions on what the trigger point will be — ranging from economic collapse and global war, to rampant virus outbreaks and civil strife — but they share the same feeling that things are more delicate than the mainstream media would have them believe, and that the best way of ensuring one’s welfare is to prepare for an era of disruption and dramatic change. These people can count themselves as among the lucky few, because preparation and proactive behaviour is always better than unpreparedness and reactive behaviour. 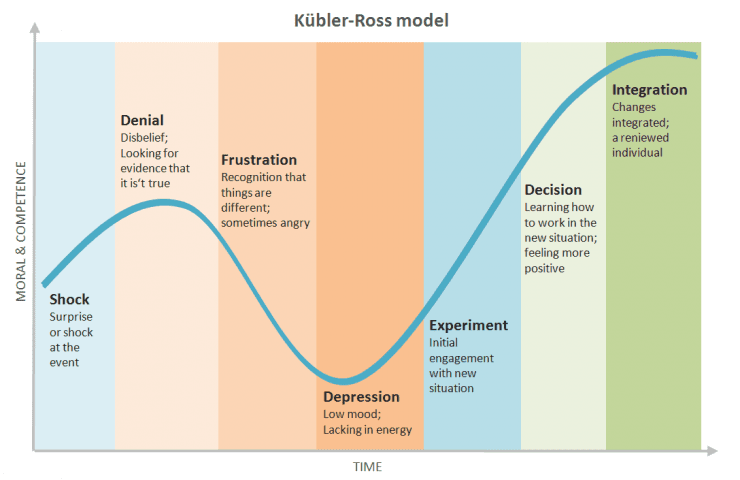 Once they have got over the psychic shock that usually accompanies a realisation of an uncomfortable truth, and then proceeded through the standard stages of the Kübler-Ross Change Curve (also known as the Five Stages of Grief Model), they will find themselves at the ‘acceptance’ or ‘integration’ end of the process. This is the point where they decide to do something useful about the predicament they find themselves in. Not everyone, however, makes it as far as the acceptance stage. Many get caught up in the ‘frustration’ and the ‘depression’ stage of the process, and find they cannot escape. These people see little or no point in continuing, and often they adopt a nihilistic outlook as a coping mechanism. It is as if they are being pulled into a black hole. And yet if they can pull themselves away from the gravitational well of despair and make a commitment to moving forwards to acceptance then they can be said to be demonstrating resilience. Resilience, in this case, is a dogged determination to make the best of the scenario you find yourself in, despite the fact that you have no control over the wider situation. It is the conscious decision to take control and do something useful. “Something useful” is often manifested in the form of stockpiling food and other items that will be valuable to have around if they are suddenly no longer available. This is a natural and worthy start, but it is only the beginning of a much wider transformation on the path to resilience. Now that the internal reality model you were brought up with has fractured and is no longer useful, you may begin to frantically hunt for new information and make connection with like-minded people who have been through the same transformative process as yourself. Plenty has been written on the subject of resilience in the past, and the focus is usually on the preservation of one or more forms of capital. This may be because people are generally, and understandably, concerned with losing what they already have. This has led to a lot of talk about how to secure one’s financial capital (wealth) and property. Ranked higher still is how to preserve one’s corporeal presence on the planet i.e. how to stay alive if the food trucks stop turning up at your local supermarket. In other words, resilience has come to mean protecting and holding onto ones capital. But capital is an oft-misunderstood word, usually meant only to mean material assets or the means with which to produce wealth — hence its association with capitalism. But the concept of capital goes far wider when considered in the personal sense. Everybody — no matter how materially poor they are — has various forms of personal capital. It could be considered the summation of the resources that we value and have some form of control over. Logic then tells us that if we want to be happy (and who doesn’t?) we should build up our capital. 2. Hard capital. This is the stuff that you own. It includes everything that is in some way useful. Books, lawnmowers, furniture, fishing rods, guitars and that drawer of old nails and bolts in the basement. It could also include articles that are beautiful, but otherwise useless — as long as it adds value to your life in some way it can be considered part of your capital. If it isn’t useful or beautiful and it has no monetary value you should probably get rid of it. 3. Mental capital. Your mental capital includes everything that you use your brain for. We’re talking knowledge and education (specifically, education that is useful in some way), language skills, other skills (cooking, fishing, sewing etc. ), musical abilities, all the books you have stored in your head and a sense of humour. Yes – all of these are assets that are at your disposal to help ease your way through life and make it productive and enjoyable. Mental capital could also include mental health capital and — crucially — your outlook on life. 4. Social capital. No man is an island, they say, and your family and friends are of potentially immeasurable value to you. There are zero instances in history of successful societies comprised of individual loners, so it’s a good bet to build up your network of trustworthy and sympathetic people who will accompany you into whatever the future holds. Do you invest time in your relatives and children? Are you the kind of approachable person people turn to for help? Do others see value in having you around? This holds too for any groups you are a member of. 6. Employment capital. What do you do for a living? Do you enjoy your job or are you merely doing it to keep afloat, even though you dislike it? How many marketable skills do you possess? Do you have more than one way of making money and multiple income streams, or are you so specialised that if your job vanished you would have no way of supporting yourself? Admittedly hard to quantify, these are some of the questions to ask when considering the kind of work you do, how it benefits you (and the wider community), and how resilient to shocks it is. 7. Bio-capital. This is the environment you live in. If you are a millionaire living in a polluted inner city with no trees or plants then your bio-capital will arguably be lower than a penniless hermit living in a wilderness zone in the mountains. Interactions with the living natural world are crucial for human wellbeing, and the fact that so many people now have very little contact with wild animals and plants is not just a sad reflection of modern life but also a threat to the sustainability of our ecosystems. As organisms, we humans depend entirely upon the natural capital provided for free by Mother Earth. Treating ecosystems recklessly and exploiting them for short-term gain is like sawing off the branch we are sitting on. In terms of personal bio-capital, think about what you have access to or control over. Do you own a garden that could be planted up with insect friendly plants, fruit trees and organic vegetables? Maybe you don’t, and all you have are a couple of window boxes and some shelf space. This is still bio-capital — you can grow a few small plants such as tomatoes or chillies, and you can sprout beans and pulses on the shelves. Maybe you don’t even have that, and yet you can still be a guerrilla gardener or grafter (planting and grafting in communal spaces), or you could help out at a local nature reserve or organic farm, clean litter from the beach or canal you live next to … the possibilities are many. 8. Time capital. How much time do you have? A lot? A little? Many people these days are afflicted with a disease called busy-ness. They are always busy and have no time for anything! When you haven’t seen them for a while and you ask them what they have been doing they invariable respond that they have been “oh, you know, busy!” So consider how much time you have available to you. How can you make better use of the time given to you? Time, we know, is subjective: it can speed up or slow down depending on who is experiencing it and when. You can ‘time hack’ your life using methods such as meditation and contemplation, and you can strip things out of your life that are unnecessary and time-consuming. Furthermore you can become efficient at planning and executing tasks so that you have time spare to do enjoyable things. Balance is key. 9. Emotional capital. How much control do you have over your emotions? Do they control you or is it the other way around? Do you live a fearful life full of angst and worry, or do you adopt a contemplative or Stoic approach to existence? To some extent we are not able to control the emotions we are born with, but we do have a choice in how we respond to external events. Gaining a solid bedrock of emotional security is a crucial form of capital that is often overlooked. 10. Spiritual capital. Finally, we have spiritual capital. By this we mean how we relate as individuals to the wider cosmos. Since the Enlightenment, people brought up in the Western world have been taught that they are inconsequential cogs in a vast machine called the Universe. There is no meaning in life, they say, and the whole of existence is an interstellar game of billiard balls played with atoms. Needless to say, this bleak outlook represents a break not just with tradition, but also with every other human society that has ever existed. People, they say, are merely meat sacks of DNA, programmed like robots and only self-interested. Love is a chemical reaction that will one day be produced in a test tube, and consciousness is merely data on an organic chip stored in your head. Thankfully, more people are beginning to question this view. At the same time they are turning away from the major religions — which have claimed hegemonic control over the spiritual dimension for millennia — and are awakening to the personal spark of potential within themselves. A good spiritual grounding is an empowering phenomenon, and therefore a very valuable form of capital. Each of these ten forms of capital are present to a greater or lesser extent in everyone’s lives. They do not exist independently from one another, and they will usually grow in symbiosis with one another, as long as no single one becomes outsized compared to the others. Combining these ten form of personal capital are what I am going to be writing about over the coming months. It’s a process I’m calling holistic resilience i.e. considering ways in which to withstand or recover from difficult situations using a synthesis of personal capital. I’m looking forward to expanding on each of these ten forms, as well as delving deeper into the meaning of resilience and why people should be developing it. Along the way I hope to include many examples and introduce new concepts from different areas of thought.